The terracotta-coloured relief above is in the entrance hall of The Midland Hotel in Manchester. 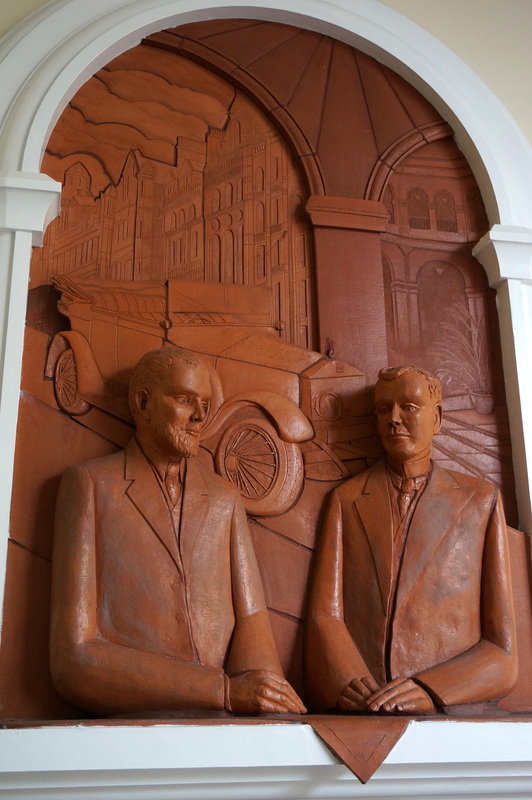 It commemorates the meeting between Charles Stewart Rolls and Frederick Henry Royce in May 1904, which later led to the formation of Rolls-Royce Limited. The first Rolls-Royce car, the Rolls-Royce 10 hp, was unveiled at the Paris Salon in December 1904. In 1906 Rolls and Royce formalised their partnership by creating Rolls-Royce Limited, with Rolls appointed Technical Managing Director on a salary of £750 per annum plus 4% of the profits in excess of £10,000 and Royce appointed chief engineer and works director on a salary of £1,250 per annum plus 4% of the profits in excess of £10,000 (figures courtesy of Wikipedia). Linked to Cee’s Fun Foto Challenge: all one colour. Nice carving. That must have been a lot of money back then. Such an awesome carving. I like the sign too!!! Great entry!